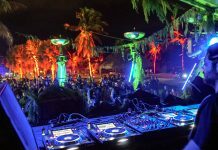 Robert Juliat followspots continue to enjoy enviable careers, travelling the world on tours with some of the biggest musical artists, including Robbie Williams, Ed Sheeran and Guns ‘n’ Roses. Robert Juliat Lancelot and Victor followspots recently turned their attention to Adele and Phil Collins with lighting designers Patrick Woodroffe and Roland Greil, both of Woodroffe Bassett Design, specifying them for Adele’s Live tours in 2016 and 2017, and Phil Collins ongoing Not Dead Yet tour. With Woodroffe receiving a Knight of Illumination Award for his Adele Live 2016 design. 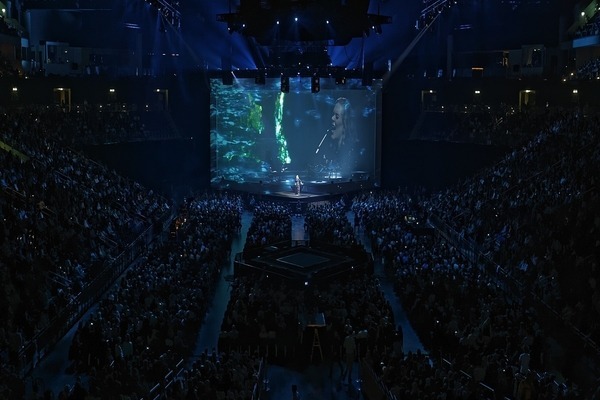 Roland Greil, Associate Lighting Designer, LD and programmer for all 3 tours, commented: “The designs for Adele’s arena tour in 2016, for which Adam Bassett was the associate lighting designer, and her stadium tour in 2017 were completely different from each other. 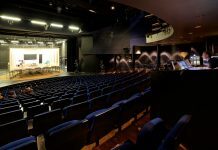 The former was based upon a very symmetrical lighting rig that was all about creating a good-looking picture frame with Adele as the centre of attention in the middle. We kept the colours muted with 80% of the lighting being different shades of white, with a few shades of blue and very little else. For Adele’s 11-date international stadium run this year, the design shifted to a circular stage and in-the-round setting to give maximum viewing for the huge audiences who packed the stadiums. Woodroffe and Greil chose 4 of Robert Juliat’s 4kW Lancelot followspots, each of which was positioned in the middle of the 4 stands so the world-conquering artist could be covered from all angles. “The varying throw distances were immense but the Lancelots were able to cover them easily,” confirmed Greil. Woodroffe and Greil continue to specify Robert Juliat with the appointment of 2 more Lancelot followspots operating from front-of-house positions on Phil Collins’ Not Dead Yet mini-tour. 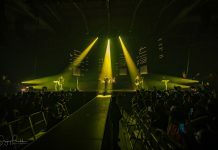 The Lancelot followspots have highlighted the veteran singer’s talents at 12 arena shows this summer from Cologne to Paris, and at the Aviva Stadium, Dublin, before headlining at Barclaycard’s British Summer Time in London’s Hyde Park in June 2017.